I’m officially one month into culinary school at ICE! How did that happen? My friends and family keep telling me how much fun it looks like I’m having (via my Instagram stories...duh) and I must say, their observations are spot on. My experience thus far has been such a blast. Call it a honeymoon phase (although the hope is that these feelings don’t change...), but the program is off to a great start. 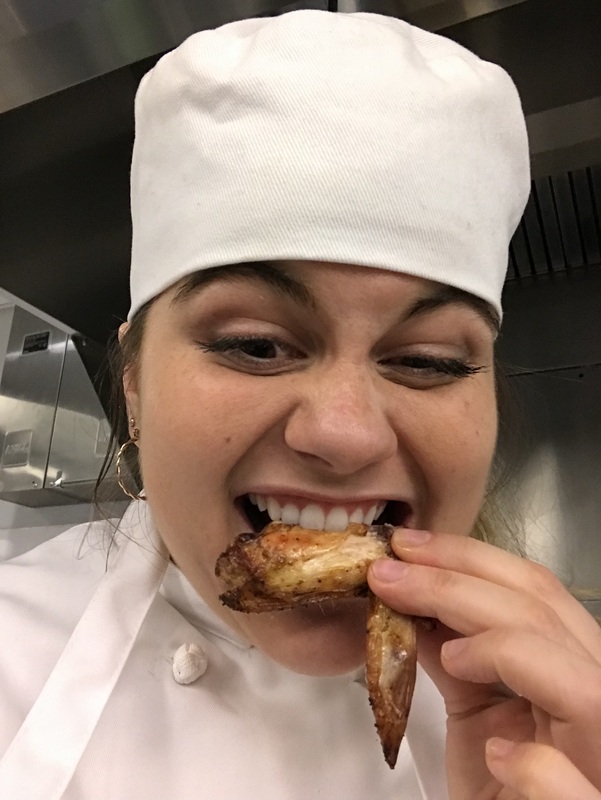 I’ve always enjoyed being a student, and it should go without saying that culinary arts particularly exhilarate me, so it shouldn’t come as a huge surprise that I’m enjoying class. You know that one random elective in college that you’d get to take among a slew of general education classes that you’re completely dreading? Culinary school feels like that fun elective—I’m genuinely excited to be there and hoping to learn as much as I possibly can. Putting that fillet knife to good use! Don’t get me wrong—there have definitely been some moments that I’m not entirely amped about. First of all, just because it’s culinary school doesn’t mean there isn’t homework, assigned readings, tests, and papers. Being a student isn’t *all* fun and games, as I’m quickly remembering. I should also mention that having a full-time job and taking part-time classes completely eats up your week. You know what’s the last thing you’ll want to do after a long day of work? Go to school! Luckily, a majority of my classmates also work full-time, so we can all commiserate about how tired we are. Plus, we’re cooking, so we get to do what we love! I’m starting to get into the habit of helping myself to a hefty cup of coffee at 5 p.m., which is a habit that I’m not proud of, but you gotta do what you gotta do, right? Now, what happens in the first month of culinary school, you ask? Lots! Our first chapter, Culinary Fundamentals, didn’t throw us into the deep end, but began to build that solid foundation of knowledge. Once we got through the food safety lectures (which have convinced me that I will surely die of Botulism or Salmonella or E.coli or maybe all three at the same time), we got to work with some basic knife skills, culinary math, a simple pesto, soft scrambled eggs, and compound butter. Just a few warm up stretches to get ourselves loose and limber for the coming chapters. In addition to culinary school, many ICE students have full-time jobs and take classes part-time. 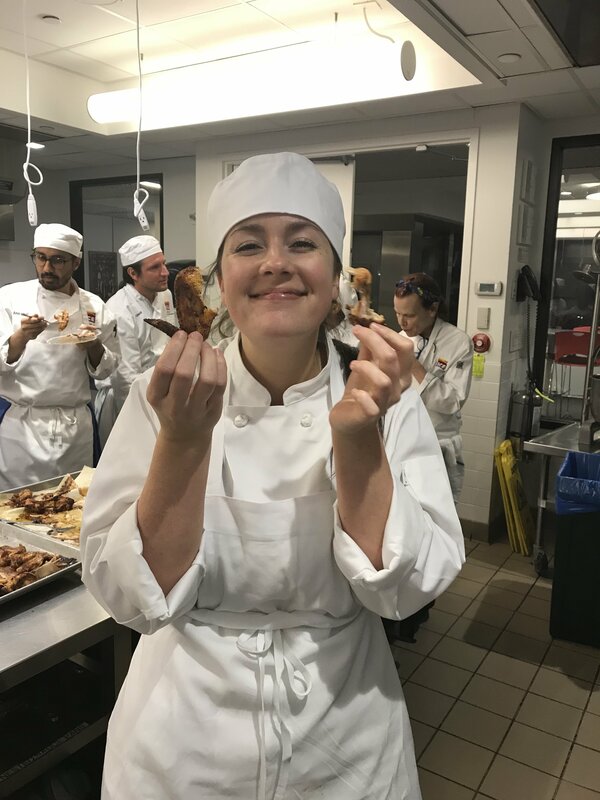 How do culinary students maintain the necessary level of energy and focus required to make it all happen? Taste testing and 5pm coffee sessions do just the trick! Another bonus is the support of classmates, like Olivia here (r)! Once we got through Culinary Fundamentals, we moved right into Fish, Meat, and Poultry. Is this...heaven? Honestly, it just may have been. 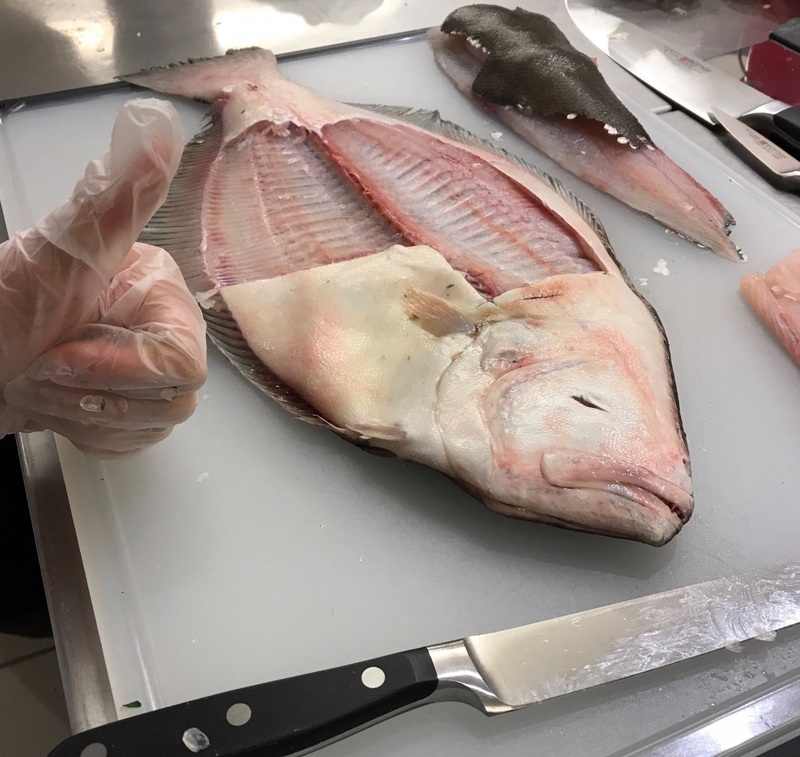 This chapter started with an intro to fish fabrication, which was wildly empowering given that I usually just beg the fishmonger to dress my fish for me. Next, we moved onto what may have been my favorite day of class thus far...shellfish day! 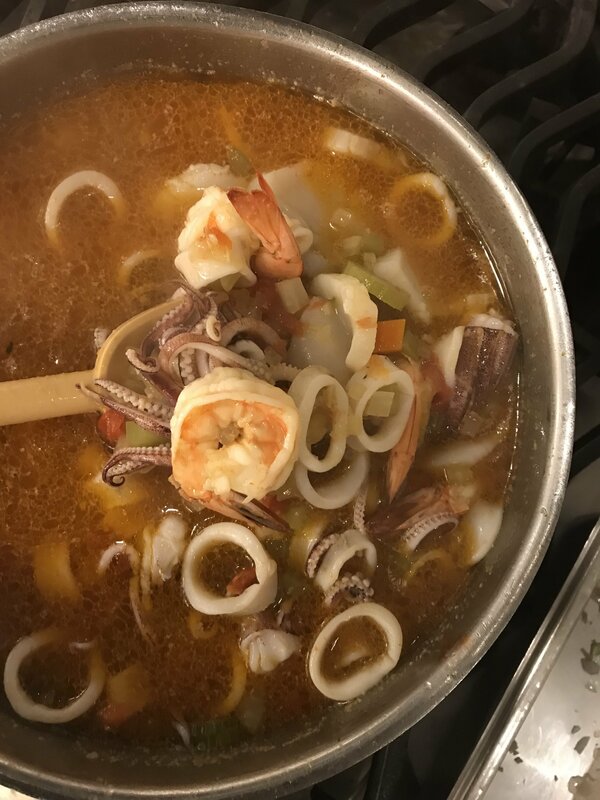 We shucked oysters, prepped squid, steamed mussels, sliced scallops, broke down lobsters, whipped up a seafood stock, and then tossed it all into one glorious shellfish soup. I was the HAPPIEST clam that day! 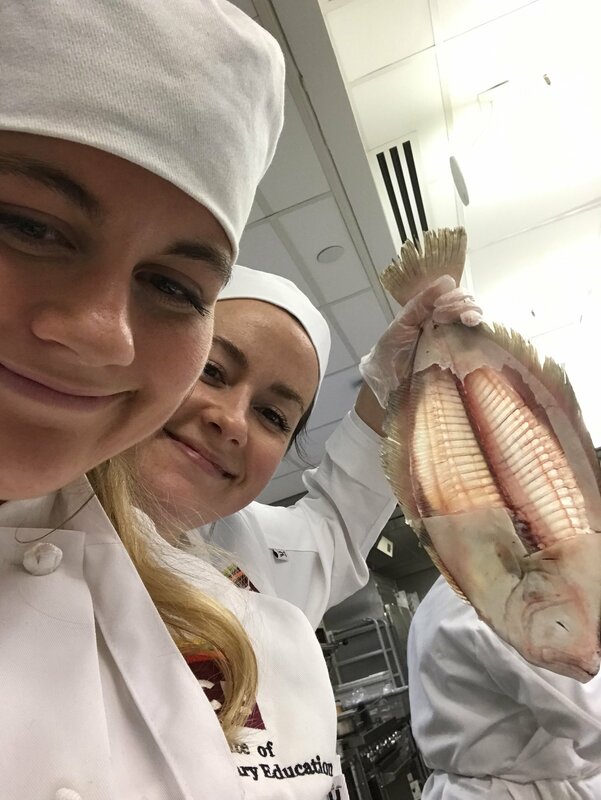 Here is one of my ICE classmates, Olivia (r), and we're making shellfish soup and learning how to fabricate a fish. I'm as happy as a clam, and the world is my oyster! After seafood, we moved onto poultry. We’re talking everything from a chicken suprême, to removing the wishbone, to the fundamentals of a chicken stock, to breaking down a duck. Once we mastered the bird, it was time to tackle the cow (not literally). I enjoyed this class thoroughly, given the fact that I probably ate my weight in red meat by the end of it. We learned how to tie a strip loin roast, cut medallions, and trim a flank steak. Mooooving right along, we wrapped up the chapter with a deep dive into all things veal, pork, and rabbit. Getting an all-encompassing look at these cuts of meat that are so familiar to me has helped to visualize where the cuts are actually coming from on the body of the animal. Hey, if this whole cooking thing doesn’t work out, butchery is looking like a pretty solid option right about now. 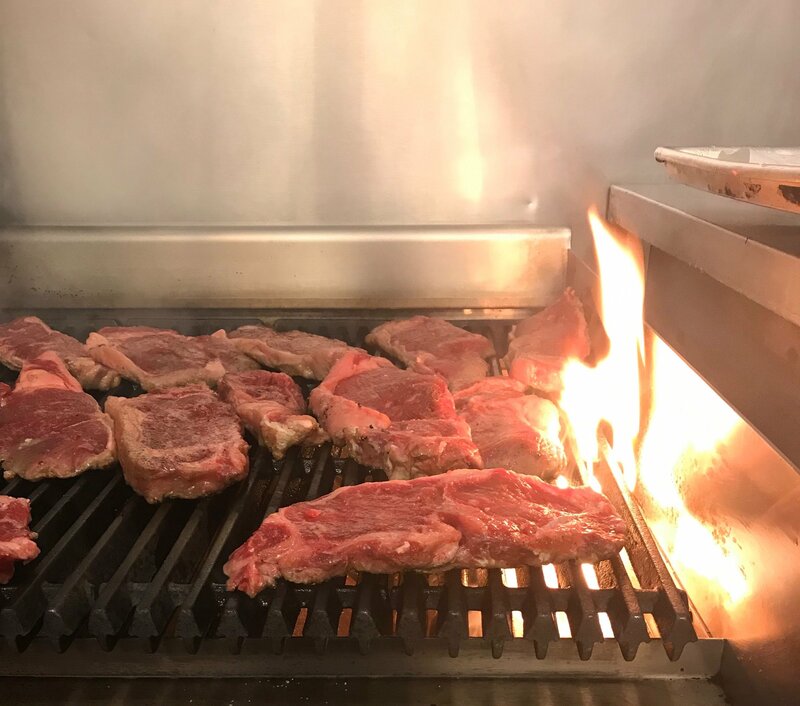 One month into culinary school, and ICE students are already on their way to mastering the tricks of the trade! Throughout the course of these last few weeks, a lot of people are asking me if I’m actually learning anything that I didn’t already know. Where they got the idea that I already know it all, I’m not sure, but I can promise you that even for someone that has years of experience in food media, there’s still plenty to be learned. A great example of the puzzle pieces coming together is learning about how to make brown stock. A couple months ago, our Senior Food Editor, Molly Adams, developed a recipe for a beef bone broth, where she called for spreading tomato paste on beef bones and roasting them. At the time, I found this technique revolutionary–how did Molly know to use tomato paste in this way?! I mean, here at the Feedfeed, we love to think outside the box and offer clients the most creative uses of their products, but this went above and beyond my comprehension of how you can cook with tomato paste. I felt this way until we went over how to make a brown stock, where our instructor explained that it’s basic protocol to spread tomato paste onto the bones that you’re roasting. To summarize, I’m onto you Molly Adams! I know your tricks now! Want to watch my intro to culinary school? Click here!